The US Securities and Exchange Commission said Monday its newly-created Cyber Unit shut down a digital currency investment scam, charging a company that took millions from investors, "falsely promising" a speedy, 13-fold profit. The SEC's Cyber Unit filed charges against and froze the assets of Dominic Lacroix, a Canadian with a history of securities law violations, and his company PlexCorps in an initial coin offering fraud. Using Facebook, the company sold securities called PlexCoin -- that its website billed as "the next cryptocurrency" -- to investors in the US and elsewhere, raising $15 million since August, and promising a return of 1,354 percent within 29 days, the SEC said in a statement. These were the first charges filed by the unit the SEC created in September to focus on fraudulent initial coin offerings of digital currency and other crimes. "This first Cyber Unit case hits all of the characteristics of a full-fledged cyber scam and is exactly the kind of misconduct the unit will be pursuing," the unit's chief Robert Cohen said in a statement. "We acted quickly to protect retail investors from this initial coin offering's false promises." The SEC won an emergency court order to freeze the assets of PlexCorps, Lacroix, 35, and his partner Sabrina Paradis-Royer, 26, accusing them of trading in unregistered securities. PlexCorps promotional materials claimed the company's executives could not be identified for security and privacy reasons when in reality this was because Lacroix had already been pursued by Canadian authorities for securities law violations, the agency said. The SEC's move comes amid mounting interest in digital currencies, with the most well-established, bitcoin, seeing its value soar this year to dizzying heights, attracting both investor interest and skepticism. The US Commodities Futures Trading Commission, which regulates trade in derivatives, last week cleared the way for mainstream exchanges, including the CME Group and Cboe Futures Exchange, to offer contracts for futures of the virtual currency. Cboe was the first out of the gate Monday, announcing it would launch bitcoin futures trading beginning Sunday. CME plans to allow trading in bitcoin futures later this month. Thirty percent of CEOs from the world's largest organizations have had their company email address and password stolen from a breached service. Given the continuing tendency for users to employ simple passwords and reuse the same passwords across multiple accounts, the implication is that at least some of these CEOs are at risk of losing their email accounts to cyber criminals or foreign nation state hacking groups. 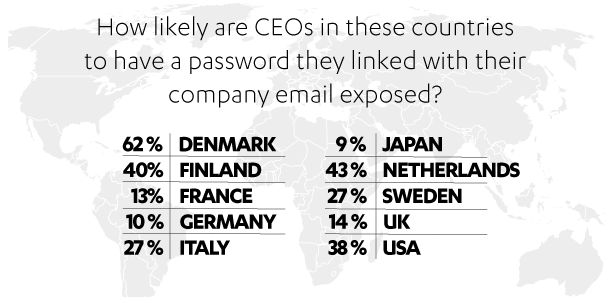 The statistic comes from a report (PDF) published today by F-Secure, whose researchers checked the email addresses of 200 CEOs from the world's largest organizations against a database of leaked credentials. It notes that the 30% figure increases to 63% for tech companies. Email accounts are highly valuable to cybercriminals, often containing sensitive information. A case in point is the hack and breach of Colin Powell's Gmail account in 2016 and the public exposure of his candid thoughts during the presidential campaign. In one email, for example, he comments, “and [Hillary Clinton] once again looks shifty if not a liar.” Researchers have suggested that Powell's account was breached because he may have used the same email password as he had for his Dropbox account -- details of which were leaked just a few weeks previously. Business email compromise (BEC) attacks also become very compelling if the finance director receives a transfer instruction that originates from the CEO's genuine email account. F-Secure found, unsurprisingly, that the top breached services to which CEOs linked their company email addresses were the professional networking site, LinkedIn, and Dropbox. Together they account for 71% of the CEOs. But it's not just email addresses and password hashes that are exposed in leaked breaches. Eighty-one percent of the CEOs, say the researchers, “have their emails and other details such as physical addresses, birthdates and phone numbers exposed in the form of spam lists and leaked marketing databases.” A mere 18% of CEO email addresses are not associated with any leak or hack. The reality is that the CEO's email account is a prized target for attackers, and CEOs need to take particular care over protecting them. One approach is to use a private account and personal phone number to disguise the company association -- but F-Secure warns that there are drawbacks in terms of defense in the later stages of the kill chain. The bottom line is that CEOs and their companies need to take particular care in protecting their email account passwords. F-Secure's advice is well-known good password practice. Use unique, long, illogical passwords that do not comprise words that could be found in hackers' word lists. Use a password manager to generate them (but, “Be wary of cloud-based password managers that don’t require access to the device in order to log into them”). Avoid social logins (if you lose the social media account, all of the associated accounts are also lost). Always use multi-factor authentication where it is available (avoiding SMS passcodes if possible: “Offline authenticators or hardware-based tokens are always preferred”). Key is the password itself. “Use fully random password strings that are as long as a particular service allows, typically 32 characters,” F-Secure Labs lead researcher Jarno Niemela told SecurityWeek. “Passwords like these are secure as long as the service provider is not storing passwords in plain text;” absent, he adds, the possibility of an intelligence agency with a really big budget which could, theoretically, find an MD5 collision. A data sample provided last month by scammers trying to make a profit by claiming to have breached U.S. credit reporting agency Equifax may have been obtained from unprotected Amazon Web Services (AWS) instances owned by a different company. Hackers exploited a known Apache Struts vulnerability to breach the systems of Equifax. They had access between mid-May and late July and they may have stolen the details of over 145 million consumers in the United States, Canada and the United Kingdom. The compromised information included names, social security numbers (SSNs), dates of birth, addresses and, in some cases, driver’s license numbers, credit card numbers and dispute documents. Scammers have been trying to make a profit by claiming to sell the stolen Equifax data for several hundred bitcoins, worth millions of dollars. One scam was run by a group calling itself Equihax, which leaked the records of Donald Trump, Kim Kardashian and Bill Gates to prove that they had the Equifax data. They also provided the records of a non-famous individual in an effort to convince people that they were the real Equifax hackers. While they likely haven’t breached the credit reporting agency, they still may have obtained some Equifax customer data, but not from Equifax itself. Researchers Aditya K Sood and Rehan Jalil had been looking for potentially new cloud threats when they identified several unprotected AWS instances that referenced Equifax. While the misconfigured databases reference Equifax, the researchers determined that they actually belong to an unnamed securities lending company based in Chicago. More precisely, they are part of the firm’s QA systems. Some of the data stored in cleartext in the unprotected AWS cloud storage instances was valid, but some of it appeared to be test data, the experts said. A data sample provided by Sood to SecurityWeek after querying the unprotected servers was in the exact same format as the data shared by scammers, which could mean they and possibly others also discovered these servers. “It could be possible that scammers utilized this security flaw as well. The data dump is the same,” Sood told SecurityWeek. Sood and Jalil have not named Equifax in their blog post – they only reference a “credit bureau” – but there are various strings referencing “equifax” in the data they found. The credit bureau (i.e. Equifax) has confirmed to the researchers that it does not control the servers exposing data. The securities lending firm was contacted by the researchers, but it had not taken any action to protect the servers as of October 8. However, some of the sensitive data stored in the databases was encrypted between September 15, when the experts first found the servers, and October 8, when they conducted additional tests. The relationship between Equifax and the securities lending company is unclear. Equifax has not responded to SecurityWeek’s inquiry regarding these unprotected systems. The spam rate of overall email dropped slightly over the past couple of months to 55% in September, but remains above the year average, a new Symantec report reveals. Spam rate last month remained above the 54.3% average registered last year, but went as high as 59.4% and 56.4% for the Mining and Manufacturing sectors, respectively, Symantec points out in the Latest intelligence report for September 2017. Driving spam rate up were massive malicious campaigns dropping variants of the Locky ransomware. During mid-September, six massive Locky distribution runs were observed. At 55% in September, the spam rate was also higher than the 54% rate that Symantec previously reported for the first half of the year. Email remains a favorite distribution method for cybercriminals, with users being twice as likely to encounter malware via email, compared to other infection vectors, Symantec says. In their Email Threats 2017 report (PDF), the company also revealed that one in nine users had at least one malicious email sent to them during the first six months of 2017. Phishing rate came in at one in 2,644 emails for September, slightly down for the second month in a row, but still well above the rates seen earlier in the year, the security company says. In July, phishing rate reached a 12-month peak at one in 1,968 emails. According to Symantec, spambots remain the primary culprits in the distribution of spam emails, with Necurs (the largest amount of malicious email activity in 2017), Gamut (focuses almost exclusively on advertising spam), Tofsee, BlankSlate, and Waledac being some of the most popular of them. For malicious payload distribution via email, attackers either use URLs or attachments, with the latter method being the most popular, accounting for 74% of the malicious emails in the first half of 2017. Email malware increased in September as well, with one in every 312 emails carrying malicious code, the security company says. Thus, September was the sixth month to register growth in email malware. At one in 120 emails, the Agriculture, Forestry, & Fishing sector was impacted the most, followed by the Mining industry at one in 196 emails. Another noteworthy event in September was the discovery of new links between attacks against the energy sector and the Dragonfly group. Dubbed Dragonfly 2.0, the campaign that Symantec has been monitoring since late 2015 has known victims in the United States, Switzerland and Turkey.